Apple Pie by Grandma Ople is a pie that I just had to try. I asked my grandson what kind of pie he wanted for Thanksgiving, and he told me apple. My first thought was, not my favorite. 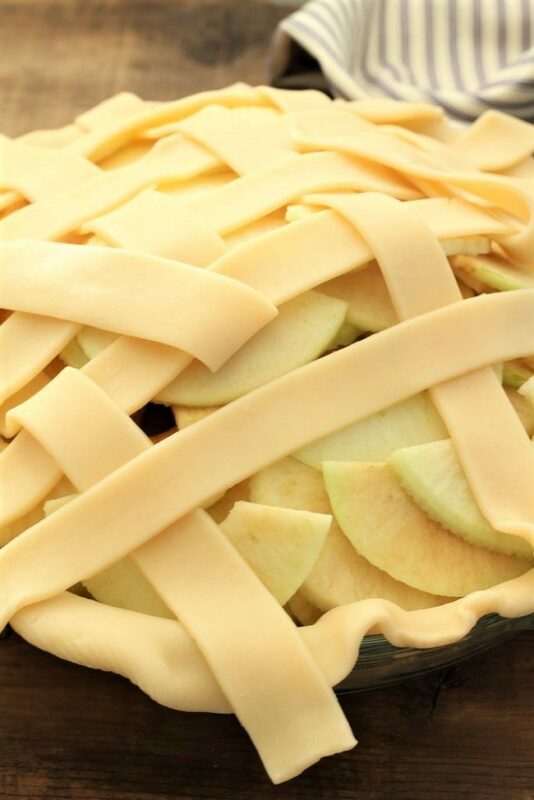 Then I said to myself, I have never made an apple pie and I am going to do it. 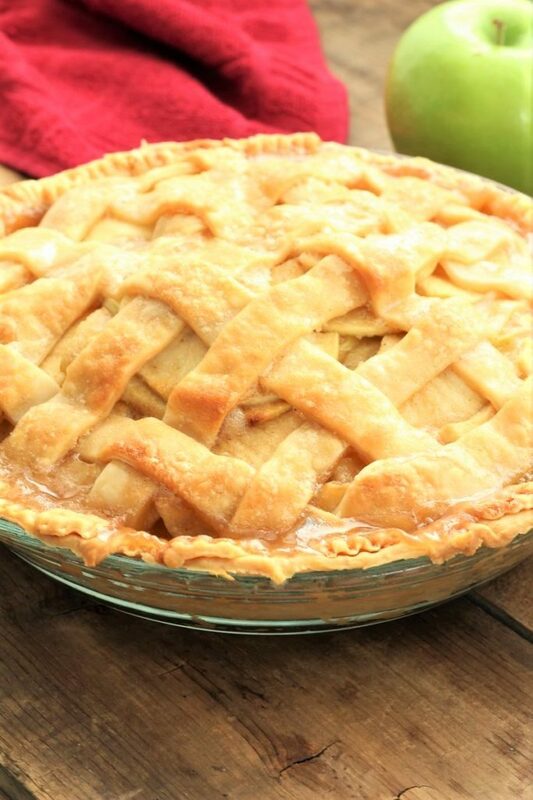 So when I googled apple pie, it took me to Allrecipes. 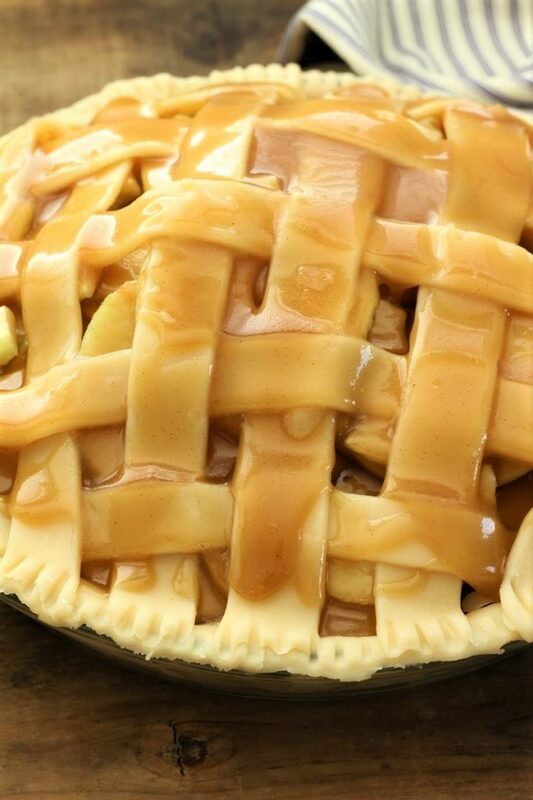 I love the sound of pouring caramel down through the crust, and on top of the crust. I was going to make a crust and then I decided that I had plenty of cooking to do, so I bought my crust. I remember when I was a little girl, we would have Thanksgiving, and my grandparents would come. My mother was the oldest of 11 children and about 6 of her siblings lived around us. I wasn’t sure why we all didn’t get together and have one big Thanksgiving feast until I started cooking my own Thanksgiving feasts. I would have loved to have an Apple Pie by Grandma Ople. It is a lot of work, however, it would be easier to make 50 pounds of potatoes than it would be to make several different dishes. Anyway, I liked having them come, and I hope that they enjoyed coming. I might have told this story before, but I remember that we always had mincemeat pie. I tried that once, and that was enough to know that I didn’t need to try it again! Ha ha. We didn’t have the pies that we have now, when I was growing up. The only ones that I remember are pumpkin and once in a while apple. I think that my mom usually bought our pies and I know that she was a busy woman. She worked out of the home from the time I was 4 years old until she was 73 years old . She fell and broke her foot and then she had to quit. She went around to the different barns in the area and she did what they called “testing cows”. She had a meter that she would hook up to the milker and the meter would tell how many pounds of milk each cow gave, and then she collected a milk sample that was tested to see how much butterfat each cow’s milk contained. She was a very hard working woman and I feel blessed to have her as a mom. My parents taught me how to work and the value of money. They also taught me how to do the right thing and how to treat people right. I must say that those are pretty important lessons to learn. I sure hope that I have done the same for my kids. As I was sitting here typing this blog, I heard my husband on the roof. He is putting up the Christmas lights. I thought to myself, I wonder if he needs help. Then this little voice said, but it is cold outside. It is 42 degrees and the sun is starting to go down. I thought to myself do the right thing, and so I went outside and asked him if he needed any help? Luckily he told me that the lights were going up pretty fast and that he didn’t need any help. I thought to myself, am I getting old or what, I use to go out and help on the farm when I was young and the cold didn’t bother me as much as it seems to now. I guess that I use to go outside more back then. Also I think that our bodies adjust better when we are young. And I need to remember that the cold is not going to kill me. I do hope that you all have a wonderful Thanksgiving and that you get a chance to try a piece of Apple Pie by Grandma Ople. Whoever grandma Ople is, she did a great job with her apple pie! 1- Put the first pie crust into the pie plate. Then cut the strips for the top. 2- I started the butter and sugar sauce and then I peeled the apples. Not sure if it matters, but I didn’t want my apples brown. 3- When the pie is finished, sprinkle it with just a touch more of cinnamon. 4- Garnish with ice cream or whipped cream. Place one of the pie crusts into a 9" pie pan. Peel and slice the apples. Place them in the pie crust. In a medium size, heavy pan, melt the butter. Then add the flour to make a paste. Stir the sugars and the water into the pan allowing it to boil, then let the mixture simmer for about 5 minutes. 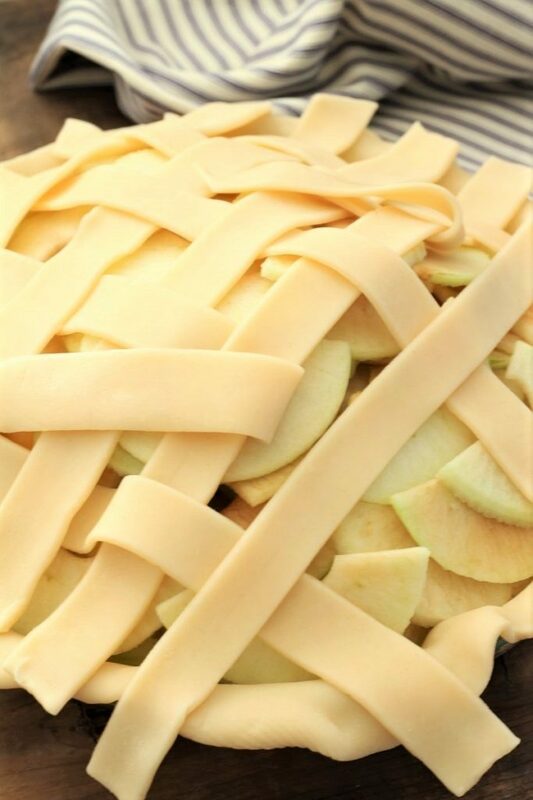 Cut your second pie crust into strips that are about 1" wide. Criss cross the pieces making a lattice top. 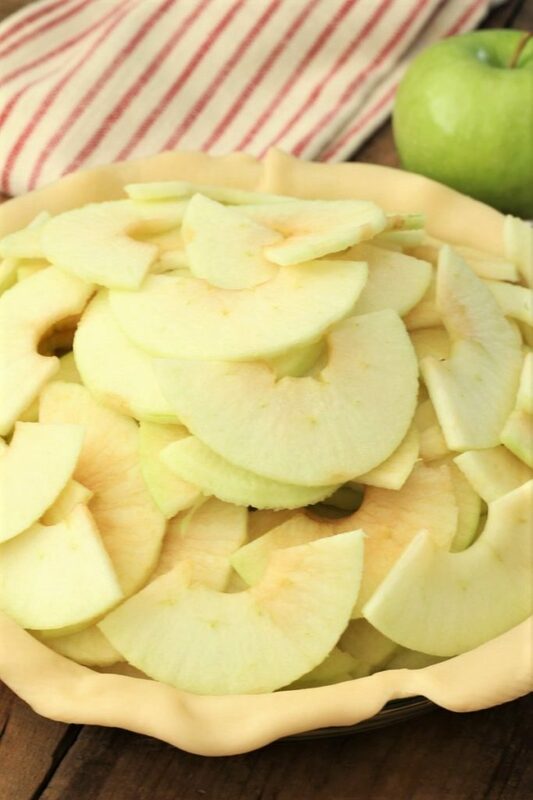 Trim around the outside of the pie plate cutting off any extra dough. Take the mixture and pour it into the pie. It is okay if you get it on the crust, it makes it nice and sweet. Bake the pie at 425 degrees for 15 minutes, then turn the oven to 350 degrees and allow the pie to cook for 40 - 50 minutes more. Poke the apples with a knife or a fork to check for doneness. I love recipes from grandmas… especially if they involve pouring caramel over the top 😉 This looks delicious! Oh, Carlee I am with you! There is something about caramel that is so delicious. I hope that you enjoyed your Thanksgiving! Thank you so much for reading my posts – you are so kind. I was so pleased with how well this pie turned out. This looks fantastic I would adore some with custard! THank you. It would be fabulous with some custard! Thank you for coming by. This is a really good pie. What a gorgeous pie! 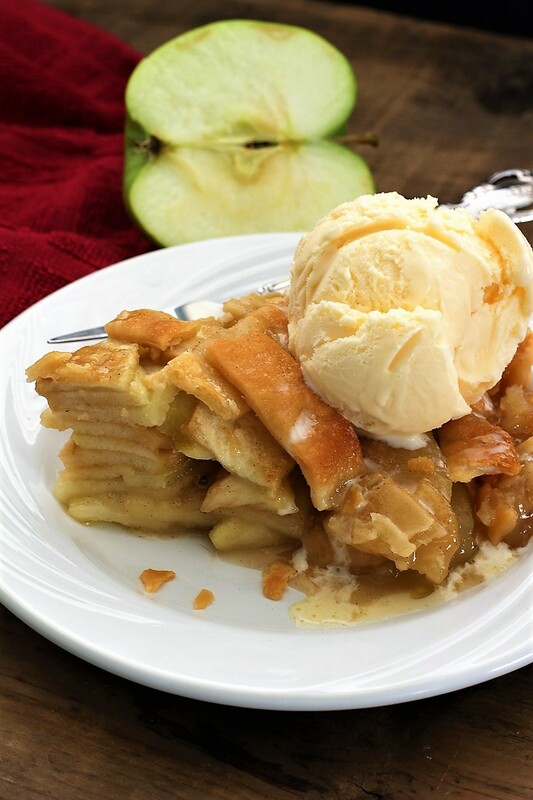 I love Apple Pie with a scoop of vanilla! This one looks like perfection! Thank you for coming by and leaving a comment. It really is a good apple pie and yes the scoop of vanilla ice cream adds to it!